January is like pressing the reset button and we start anew. Whatever sinful indulge that we have last month, the seafood feast the month before last month, or even the slice of rich and good cake three months ago; all these are behind us – we shall eat our way through all over again. To begin the new year, I will like to start with an awesome Home-made Beef burger ($12); it’s best not to resist, you know you want it. I like burgers, not those from MacDonald, or Burger King. I mean real burgers with a gorgeous beef patty covered by a slightly toasted fluffy bun, throw in some lettuce, add in a slice of cheese, and even better if there’s caramelized onion – there you have it, a good hearty burger. I can think of all sorts of excuses just to have a bite of this; honey it’s just a ten minute drive from our place; sweetie lets not cook dinner, it’s easier to eat-out; darling shall we go for supper? Fancy it ain’t, but who cares, because this burger is a keeper. The only problem is not getting addicted to it. A word of advise: stick to the homemade beef burger, I made the mistake of being too adventurous and went for the Steak sandwich ($12), and it’s not because the sandwich isn’t satisfying, but nothing can beat a big, hearty burger. 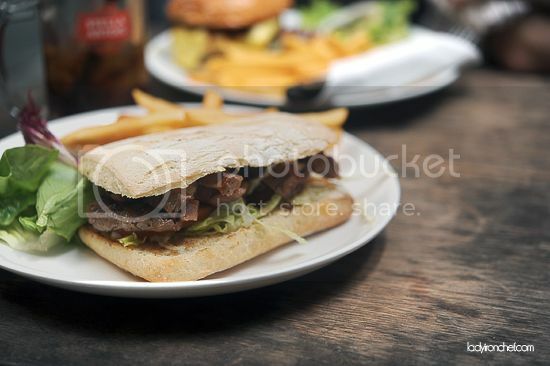 While I did not like the steak sandwich, my friend enjoyed it thoroughly; steak is after all, steak, and unlike the beef patty that is made of minced meat. There has been a mad rush of new burger joints; Burger Shack, Freddie’s burger, R Burger, The hamburger, Sunshine @ Carries, Fatboy’s burger bar, even though I have yet to try most of them, Smok’Inn Frogz Kitchen at Bar Bar Black Sheep is still by far one of my favorite place for a good, hearty burger. See you there! Tell me, where’s the best burger? PS. Love the new layout colour palate! How on earth do you manage to stay so slim after eating all this food? you are very lucky! i kinda like freddie’s burger, it’s simple fare but i like the (beef) patty. i heard there’s nothing to shout about for bk’s angus beef burger, so you might not want to waste calories on those heh. i agree with harris.. dont waste your money of BK angus burger. Leona: haha burgers are photogenic to begin with, they look so good right? hee nah i run a lot, if not how to cope with so much food? harris: I haven try the freddie’s burger yet, ya the angus beef patty looks very thin! i so agree with you on that. so far.. smokin frogz has the best burger patty for me! 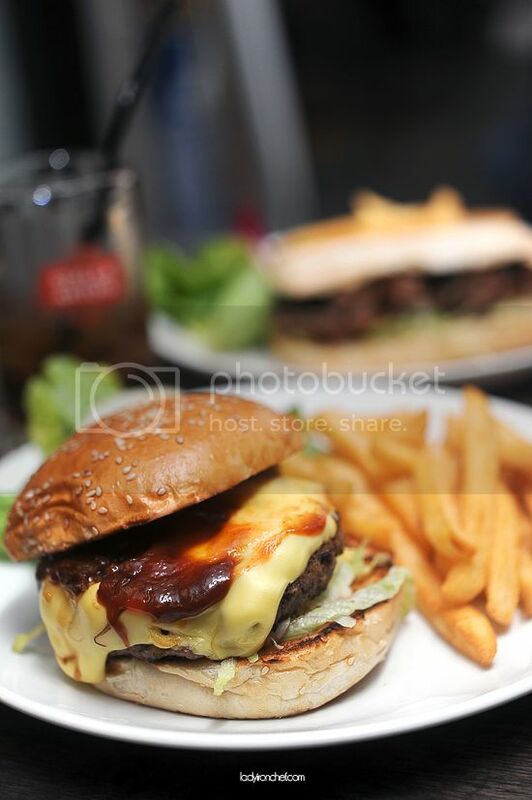 sihan: Oh yeah, by far one of the best burger patty, and not to mention it’s so near us! cant help it but 2 poke my nose to the comments..
Ouh… their steak is worth the try.. their mashed potato & sauce… DELICIOUS! Does the 12 SGD include the fries and salad?